On this Maine and Eastern Canada tour, get acquainted with the local culture, charming villages, and seafaring traditions of Nova Scotia, Prince Edward Island, Cape Breton Island, New Brunswick, and Maine. 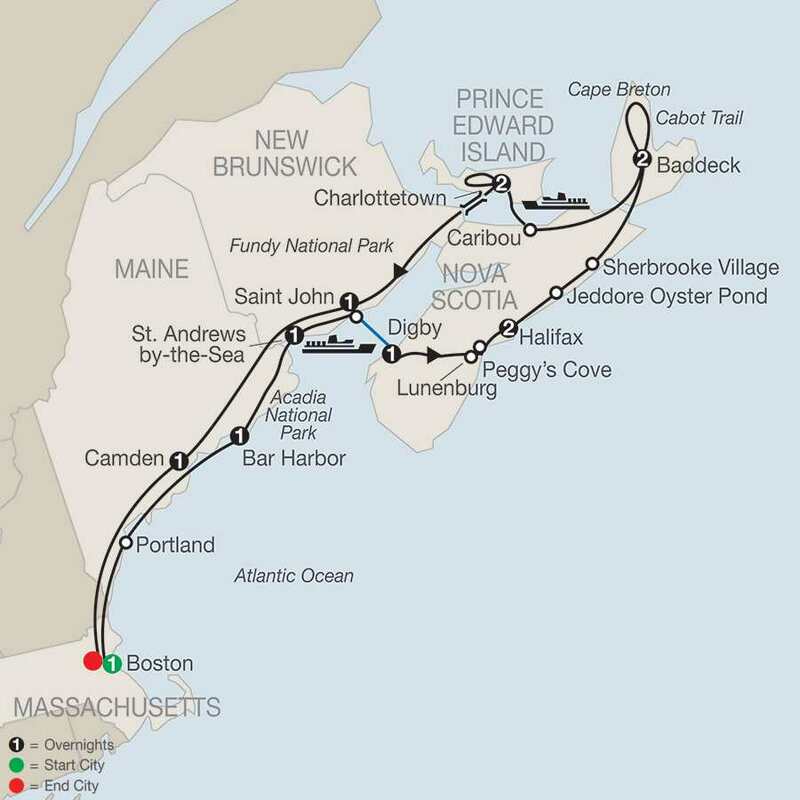 Start and end your vacation in Boston with overnights also in Bar Harbor, St. Andrew’s by-the-Sea, Digby, Halifax, Baddeck, Charlottetown, Saint John, and Camden. 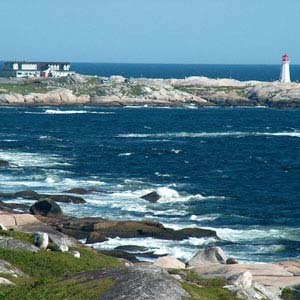 Breathtaking scenery awaits you on this tour through Eastern Canada and Maine. In Maine, visit Acadia National Park, home to rugged coasts and the tallest mountain on the US Atlantic coast. In Nova Scotia, spend time in the fishing village of Digby, with breathtaking beauty and views; stop at Lunenburg, a UNESCO World Heritage Site; visit Peggy’s Cove, a charming fishing village with a famous lighthouse (one of the world’s most photographed places); and take the scenic Marine Drive from Halifax along the Atlantic shoreline through picturesque fishing villages. On Cape Breton Island, drive along the world-famous Cabot Trail, named one of the world’s most scenic drives, and visit Cape Breton Highlands National Park, where the mountains and sea meet. Throughout this Eastern Canada and Maine tour, we have arranged fun and unique experiences for you. For example, in Digby, enjoy a private demonstration by a local fisherman who will explain the importance of the Digby scallop. See a typical fisherman’s house from the early 1900s when you visit the Fisherman’s Life Museum in Jeddore Oyster Pond. Welcome to “Bean Town”! At 6 pm, meet your traveling companions for a welcome drink. Your Tour Director will prepare you for your upcoming adventure. Nowhere along the Atlantic seaboard is the rock-bound coast as picturesque as in ACADIA NATIONAL PARK, one of America’s most visited national parks. Take the scenic park road and enjoy the spectacular panorama from the summit of Cadillac Mountain, the first place in the continental United States to see the sunrise. After time at leisure in Bar Harbor, travel across the border to lovely St. Andrews By-the-Sea. Tonight, stay at the Algonquin Hotel, which overlooks historic Passamaquoddy Bay. This evening, choose from the many fine specialty restaurants this quaint seaside community has to offer. This morning, follow the coast to Saint John and board a catamaran FERRY to Digby, a popular summer resort. Your hotel tonight is the Digby Pines Resort, a world of casual elegance in the tradition of the grand hotels. Surrounded by breathtaking beauty, you will have an opportunity to enjoy the views, recreation, and internationally renowned cuisine in this Norman-style chateau. Before dinner this evening, enjoy a private DEMONSTRATION by a local fisherman who will explain the importance of the Digby scallop and introduce you to Nova Scotian music. Later, dinner is included at the resort. 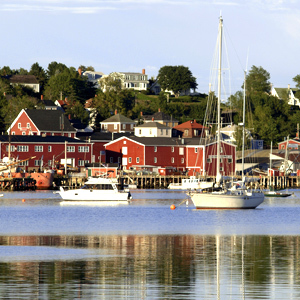 Today, travel toward Nova Scotia’s Atlantic coast and follow the winding shoreline to Lunenburg, one of the continent’s major fishing ports. Here, visit the FISHERIES MUSEUM before heading to Peggy’s Cove, a charming fishing village with a famous lighthouse perched on a massive granite ledge (one of the most photographed places in the world). End in Halifax, the provincial capital and your home for the next two nights. Take the scenic Marine Drive north along the Atlantic shoreline through picturesque fishing villages, stopping en route in Jeddore Oyster Pond at FISHERMAN’S LIFE MUSEUM, a typical Nova Scotia fisherman’s house from the early 1900s. Visit SHERBROOKE VILLAGE, whose renovated buildings recall the boom years of the 1860s. Via Canso Causeway, cross over to Cape Breton Island, one of the first footholds of European settlement in the New World. Continue to Baddeck. Morning visit to the ALEXANDER GRAHAM BELL MUSEUM. Study exhibits tracing the achievements of the great inventor, who spent the last years of his life on Cape Breton. Then, drive along the CABOT TRAIL, the area explored by John Cabot in the late-15th century, while savoring magnificent vistas of the rocky shoreline and the Gulf of St. Lawrence. At the Acadian village of Cheticamp, enjoy a DEMONSTRATION on how the famous hand-hooked rugs are made, along with a traditional Acadian lunch. Finally, see CAPE BRETON HIGHLANDS NATIONAL PARK at the northern tip of the island, a landscape that strikingly resembles Scottish coastal regions. Return to Baddeck. Head back to the peninsula and continue north to Caribou, where a FERRY whisks you across the Northumberland Strait to Prince Edward Island. For the next two nights, you are in Charlottetown, the provincial capital. Get acquainted with this colonial town on a stroll through colorful Great George Street and along the restored waterfront. This evening, enjoy a lobster supper at a local restaurant. Morning at leisure. Enjoy a guided afternoon tour of the island that includes PRINCE EDWARD ISLAND NATIONAL PARK. Also visit GREEN GABLES farmhouse, the setting for the famous novel Anne of Green Gables. Travel across the 8-mile Confederation Bridge to New Brunswick. Here, enjoy a guided visit of the HOPEWELL ROCKS, famous formations carved by the Bay of Fundy’s dramatic tides that rise more than 50 feet, before driving through FUNDY NATIONAL PARK. Upon arrival in Saint John, enjoy a city orientation tour including the Reversing Falls. Journey along sheltered coves and quiet fishing villages along the Maine coastline on the way to Camden. This evening, your Tour Director hosts a special farewell dinner featuring lobster and other local specialties. Wonderful conversation and cuisine make the perfect finale for your vacation. Resort Manor situated on beautifully landscaped grounds overlooking bay. This premium resort is ideally located on 300 wooded acres and steps away from the Annapolis Basin. The hotel features an outdoor pool, fitness center, shuffleboard, and 147 elegant guestrooms. This deluxe hotel is equipped with full service fitness center, on site spa, business center, as well as a restaurant and lounge. Nourish your soul in the Halifax Restaurant Elements, featuring locally inspired Nova Scotia Cuisine and wines, and awarded with a Wine Spectator Award. In the summer enjoy outdoor patio seating in the lounge. A local shuttle is available complimentary to guests at select times of the day. Two-story Motor Hotel on spacious grounds at western boundary of village, overlooking Bras d’Or Lake. This elegant hotel is beautifully situated in the heart of Charlottetown on the Prince Edward Island and features spacious guestrooms refined dining, and ultimate comfort. The amenities include a fitness center, concierge services, laundry services, and large indoor pool. A deluxe hotel located in downtown Saint John, the Delta Brunswick features premium accommodations. The hotel includes a fitness center, indoor pool, gift shop, and beauty salon. All 254 guestrooms are equipped with ultimate comfort and modern amenities. In this family friendly hotel, you will discover the casual essence of Camden and Rockport Maine and come to know you can just be yourself here. Anne of Green Gables – The Musical Canada’s longest running musical returns for its 46th season! Anne will touch your heart and your funny bone through drama, song and dance. Loved by millions around the world, this family classic relives the poignant and funny story of Anne Shirley, the spunky, red-headed orphan who comes to Prince Edward Island hoping to find a happy home. Subject to show schedule and availability.